Buying an interactive whiteboard (IWB) is a decision that shouldn’t be taken lightly. There are many options on the market in 2019, and the pricepoint varies widely depending on the kind of technology you opt for. It could be that a basic black and white smartboard will suit your needs. There’s also full color IWB’s. Do you need smart phone connectivity? 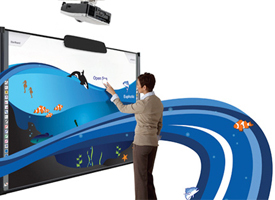 Are you interested in the benefits of having a fully fledged 4k UHD interactive smartboard? To help you in your search we have pulled together 5 top model boards, covering a range of budgets and specifications. A summary of our findings are laid out in the table below. For an ultimate IWB buyer’s guide plus in depth reviews of each of the selected boards, keep on reading. Quality, build design, level of features and warranty support are all important factors that have enabled us to rank the available interactive boards for review. Based on these rating criteria (and a whole lot more), we have selected what we believe to be 5 of the best interactive whiteboards on the market today. The Plus C-20W is a portable integrated IWB unit that comes with 2 writing surfaces, integrated application layer, and network support that allows for internet connection, as well as data storage and retrieval from remote FTP (file transfer protocol) servers. It uses the pen mode, and its writing surfaces allow for horizontal scrolling, which increases the effective writing area beyond the physical area bound by the IWB frame. The board is designed to operate as either a copy-board or a capture-board depending on current needs. As a copy-board, it allows data/information written on its surface to be stored, transmitted to a remote server, or printed via an optional printer (which must be acquired separately). Relatedly, the standard IWB capabilities of its writeable screen surface makes it an effective capture-board that can be used with frontal projection system to write over projected images. This high-performance, feature-rich, and high-quality IWB is designed and made by the Plus Corporation of America, and its model number is C-20W. This IWB model can be installed in two ways; wall mounting (or partition mounting) using magnets attached to the IWB, or mobile floor mounting to a self-standing mount with T-shaped legs. a CD user manual and hardcopy documents with setup and assembly instructions. A pair of vertical frame covers must be fitted on the IWB frame, while a sheet covers the panel that serves as the projection field (with the sheet allowing one to write and draw diagrams that overlay the projected image). The IWB control panel is located at the lower section of the left vertical frame cover. It has press buttons that allow one to save work in a USB or PC; or print it in color or black-and-white. On the downside, this board lacks mouse functions across the projection field. The entire ready-to-use unit weighs about 55pounds, while the IWB is 78inches long, 39.4inches high, and 3.5inches thick. The mobile mount weighs 27.5pounds, and is sometimes omitted from the package. The color scheme of this IWB unit is silver-gray-white. as well as Mac OS X 10.5 and later editions. Its application layer allows for internet connectivity through the following web browsers: Internet Explorer 8.0 and later editions, and Safari 5 and later editions. The IWB is a standalone computer that can be password-protected to ensure unauthorized users cannot use it as a copy-board or capture-board, but can still use it as a traditional whiteboard. It also makes it compatible with color laser and inkjet printers with (printer) connection provided by Type A USB port. If the data cannot be printed immediately, then it can be saved in the internal memory (local drive) whose storage capacity is 32GB. The other alternative is to connect an RJ-45 network cable to the ethernet port which allows the IWB data to be stored or shared across a networked system, including a system that incorporates FTP servers. Its application layer allows for task organization and communication-wide organization, besides allowing data to be saved and retrieved from USB drives. Relatedly, when connected to the PC, it is recognized by the PC OS as an external memory device from which stored data can be downloaded from, or PC data can be uploaded into the IWB. The effective writing surface is 70.1inches long and 35.4inches high. This is also the size of the scannable area (also described as scanning surface area). The endless horizontal scroll greatly maximizes the writing area on each panel, while capture-board functionality is supported by saving options that allows projected images, written notes, and drawn charts and diagrams to be saved in PDF formats for documents or JPG or PNG image formats. The scanning time (duration for capturing the entire projection field) is 21 seconds for both color and black-and-white formats with the scan resolution capped at 50dpi. Even so, print resolution are capped at 300dpi. The writing surface RGB LED as the light source for native illumination. Paging is achieved using horizontal scrolling, with its drive method being sheet movement; while a contact-image sensor provides reading capabilities. Two writing surfaces means that this IWB has 2 pages. The internal memory can save up-to 100pages, though this number varies depending on the data types. Smartphone integration is provided by an application called meeting pocket app (MTG App) which can be installed in both Android and Apple smart devices. This app provides scan function that allows the projected image to be saved in the phone, tablet, or phablet. Moreover, the app allows for video and audio recording, with the recorded files bundled in the same folder as the saved projected image. This allows for file organization. Even so, this app can connect to the IWB via a wireless access point (WAP). This is an energy efficient IWB model that requires AC power input of 100-240 Volts (V) at 50-60Hertz (Hz) with current flow capped at 0.75amperes (A). It uses 3 watts (W) when in standby mode, and this increases to 12W during operation without a printer. Its power output is 12V direct current (DC) at 3.0A. This IWB model benefits from a 12-month warranty. Effective writing surface is 70.1inches long and 35.4inches high. Supports wall-mounting and mounting on wheeled mobile stands. Endless horizontal scrolling on writing surface. Can be used as a capture-board or copy-board. Network support and smart-phone integration. Multiple output formats: PDF, JPG and PNG. Smartphone integration provided by a stable MTG app. IWB has internal storage of 32GB. Printer must be purchased separately. Lacks mouse (click-and-drag emulation) functions across the projection field. IWB lacks internal speakers hence audio support must be provided by external speakers. Plus C-20W is a portable integrated IWB unit that comes with 2 writing surfaces, integrated application layer, and network support that allows for internet connection, as well as data storage and retrieval from remote FTP servers. It uses the pen mode, and its writing surfaces allow for horizontal scrolling. It supports wall-mounting and mounting on wheeled mobile stands, and can be used as a capture-board or copy-board. It also allows for quick scan with the scanned file being saved in multiple output formats: PDF, JPG and PNG. It also has an internal storage capacity of 32GB, and is supported by a 12-month warranty. These aforementioned features along with its high quality and good build design make this IWB model the best color smart board in this review. This is a portable integrated IWB unit that operates as a copy-board with 2 writing surface and an integrated application layer. Its construction and operational designs are quite similar to the Plus C-20W, though devoid of capture-board capabilities, as well as lacks network supports which eliminates remote data transfer potential. Even so, it uses the pen mode, and its writing surfaces allow for horizontal scrolling. It only allows for data/information to be written on it, and thereafter erased, stored, or printed via an optional printer (which as expected must be acquired separately). Lack of capture-board hardware and functionalities also makes the Plus M-17S much cheaper and lighter (less heavy) than the C-20W, which is also designed and made by the Plus Corporation of America. The model and part numbers of this copy-board are M-17S and 423-084 respectively. Just like the C-20W, this copy-board can be installed in two ways; wall mounting (or partition mounting) using magnets attached to the IWB, or mobile floor mounting to a self-standing mount with T-shaped legs. A pair of vertical frame covers must be fitted on the IWB frame, while a sheet covers the panel that serves as the projection field. The ready-to-use copy-board weighs about 33pounds, while the IWB is 58.3inches long, 39.4inches high, and 3.5inches thick. The mobile mount weighs 23pounds, and is sometimes omitted from the package. The color scheme of this IWB unit is silver-gray-white. In this copy-board, horizontal scrolling of the writing surface allows for two writing surfaces to be combined side-by-side into a single writable surface. Its control panel is located at the lower section of the left vertical frame cover. It has press buttons that allow one to save work in a USB or PC; or print it in black-and-white. Just like the C-20W, this copy-board has the same downside, lack of mouse functions, including click-and-drag emulation, across the projection field. Functional-wise, this copy-board differs from the capture-board in one major way – the copy-board can only print black-and-white images while the Plus C-20W has the additional benefit of printing color images. The panel size is 51.2inches long and 35.8inches high, while the effective writing surface is 50.4inches long and 35.4inches high. This also defines the scanning surface area. Its copy-board functionalities are supported by saving options that allows for written notes, and drawn charts and diagrams to be saved in PDF formats for documents or JPG or PNG image formats. The scanning time is 15 seconds with the scan resolution capped at 50dpi. Even so, print resolution are capped at 300dpi. Scanning is quicker in this copy-board as compared to the C-20W capture-board because the copy-board has a smaller scanning area. The writing surface and reading area of this copy-board uses RGB LED for native illumination. Paging is achieved using horizontal scrolling, with its drive method being sheet movement; while a contact-image sensor provides reading capabilities. Unlike the C-20W model, the M-17S model lacks a stable smartphone integration. Its application layer allows for internet connectivity through the following web browsers: Internet Explorer 6.0 and later editions, and Safari 4 and later editions. Printer connection is provided by Type A USB port. Furthermore, even if a color printer is connected, the printed document would still be black-and-white. On the upside, batch printing is supported with 10 documents being printed simultaneously. Nonetheless, if the data cannot be printed immediately, then it can be saved in the internal memory (local drive) whose storage capacity is 32GB. Its application layer allows for task organization and communication-wide organization, besides allowing data to be saved and retrieved from USB drives. Relatedly, when connected to the PC, it is recognized by the PC OS as an external memory device from where data can be retrieved or stored. This copy-board is an energy efficient IWB that requires AC power input of 100-240 V/50-60Hz with current flow capped at 0.75A. It uses 3W when in standby mode, and this increases to 12W during operation without a printer. Its power output is 12V DC at 3.0A. It also benefits from a 12-month warranty. Effective writing surface is 50.4inches long and 35.4inches high. Supports batch printing of up-to 10 pages simultaneously. Can print only black-and-white documents. The Plus M-17S is a portable integrated IWB unit that operates as a copy-board with 2 writing surface and an integrated application layer. It uses the pen mode, and its paging allows for horizontal scrolling. It supports wall-mounting and mounting on wheeled mobile stands. It also allows for quick scan with the scanned file being saved in multiple output formats: PDF, JPG and PNG. Even so, it only supports black-and-white printing, with an allowance for batch printing. It also has an internal storage capacity of 32GB, and is supported by a 12-month warranty. These aforementioned features along with its superior construction quality and good build design make this copy-board the best black and white interactive whiteboard in this review. This is a 75-inch complete standalone IWB whose all-in-one touch PC provides a highly cohesive software-to-hardware interface that allows for tele-conferencing, including video-conferencing, to be combined with whiteboarding. Furthermore, the 10-point multi-touch capability of the TFT LED touchscreen allows the user to switch interchangeably from the finger-mode (touch-mode) to the pen-mode. The touchscreen is overlaid on a 4K infrared display. Its hardware supports a harmonized communication system that features collaboration tools and corresponding support services, including cloud support through OneScreen Connect Cloud and Swap Cloud and related Annotate services. Real-time support services are also provided via Skills Guru, which attests to the high-standards of technical supports that customers benefit from. This infrared, interactive, all-in-one PC-based collaboration hub is designed and made by the American company, Clary Icon as part of its OneScreen Solutions brand of collaborative tools. The Hubware H4 uses an integrated PC module that a processing unit that is compatible with Windows 10 and Android OS. 1TB of secondary hard drive memory. This processor comes with an integrated graphic processing unit that handles graphics, including multimedia graphics, diagrams, writings, and charts. The processing unit also features a separate 1.40Ghz processor that is paired with 1.5GB RAM and 8GB ROM (secondary memory) for running Android 5.0.1 and its apps, which can be downloaded from Google PlayStore. It also comes with an inbuilt camera for tele-conferencing, but it lacks an inbuilt speaker, which compels one to use the speakerphone. This camera is a 1080p full HD camera with 30fps and a lossless zoom of X10. It benefits from ZEISS lens certification and has 5 presets, with a field of view of 90 degrees, and a pan of 260degress and a tilt of 130degrees. This model is shipped in package that weighs about 282pounds, and is 77inches long, 54inches wide, and 12inches thick. OneScreen Annotate Software, and OneScreen Swap Cloud Service. There is also a user guide, and a separate installation guide. The fully set-up IWB weighs about 165pounds. The color scheme for the IWB frame is black. This model uses infrared touch sensing technology that allows for three input methods; finger, stylus, and pen. Its speakerphone features two expansion mics with 20-feet diameter range. This Bluetooth-enabled speakerphone uses AEC audio encoding, and has a sensitivity of -28dB. Additionally, the keyboard comes with touchpad functionality, and the wireless range of both the mouse and keyboard is 33feet. This model is flush mounted on the wall. Its PC inputs and outputs are 5 USB ports, a VGA port, a HDMI port, an RJ45 ethernet port, and an ear and mic ports. The VGA and HDMI ports allow for additional monitor displays to be connected to the IWB. There are also 2 touch USB ports, 3 HDMI ports, an RS232, YPBPR, AV and Audio input ports, as well as a VGA and an RJ45 ethernet port. The main audio output ports are a mini-AV port, an audio CVBS output terminal, coaxial audio, and an earphone port. The 75-inch touchscreen interactive display has a resolution of 3840 X 2160, with a dynamic contrast of 4000:1 and maximum screen brightness set at 350 candela-per-square-meter (cdm-2). Its color depth is 10-bit and the number of colors is 1.07billion. This display benefits from a crystal-clear anti-glare tempered glass overlay. The touch response is about 8 milliseconds (ms) which gives the users instantaneous interactivity. Furthermore, an aspect ratio of 16:9 for wide-screen views. The external dimensions of the monitor display are 69inches by 42inches. This model comes with a feature-rich application layer whose groupware supports the hubware attributes of the IWB. This includes support for ad-hoc conferencing, video conferencing and whiteboarding. The OneScreen Connect Cloud Service serves to secure data transfer during video conferencing, while OneScreen Swap Cloud Service saves shared data and images. Relatedly, OneScreen Annotate Software supports brainstorming sessions. This allows for up-to 8 ad hoc participants and 99 users to be hosted simultaneously on an internet-enabled collaborative environment. Even so, OneScreen Connect Cloud Service and OneScreen Swap Cloud Service come with a 12-month subscription, after which one has to renew the subscription. This infrared IWB is designed to be used with standard 110-240V AC power. It is also backed by a 12-month warranty. Has an interactive and unified software-to-hardware interface that allows tele-conferencing to be combined with whiteboarding. Supports both pen-mode and touch-mode, which gives it mouse (click-and-drag emulation) functions across the projection field. Supports secure data transfer and storage via cloud services. Uses a high-resolution 4K display with multi-touch support. PC module is compatible with both windows 10 and Android OS. Comes with a high-quality full duplex speakerphone. Multiple input and output ports that supports multiple TFT displays. Wireless support allows for use of non-wired keyboard and mouse to control the PC. Comes with an inbuilt 1080p, 30fps Full HD camera with a lossless zoom of X10. OneScreen Connect Cloud and OneScreen Swap Cloud Services are provided for free for only the first 12months after which one must renew the subscriptions. while the 10-point multi-touch capability of the TFT LED touchscreen allows the user to switch interchangeably from the finger-mode (touch-mode) to the pen-mode. Connect Cloud and Swap Cloud and related Annotate services. Real-time support services are also provided via Skills Guru. This infrared, interactive, all-in-one PC-based collaboration hub is the best interactive touchscreen display in this review. This is a special type of portable connectable IWB that can wirelessly connect to a PC and does not need an overhead projector. This model is specially designed to transform flat surfaces into plug-n-play interactive displays. It uses ultrasound and infrared tracking technology that gives it positional accuracy of +/-1 mm. Unlike standard IWBs that come with a display panel, the Ebeam Edge Plus uses a multi-charge cradle to project an interactive display onto a flat surface, including a that of traditional whiteboard. This cradle is powered by a rechargeable battery that lasts for 8 hours once fully charged, with the charging time estimated to be 3 hours. This cradle integrates a receiver and interactive stylus into a hand-held, remote-control-sized device that can be magnetically attached onto a surface, especially on traditional enameled whiteboards. This model is designed, manufactured, and warranted by eBeam as part of its eBeam Edge+ Complete line of IWB products. This model is packaged as a marker pack which contains the multi-charge cradle, a rechargeable three-button stylus, and an Edge+ wireless dongle. The stylus is powered by a lithium-ion battery whose charge time is 3hours and can continuously power the device for 15hours. Use of batteries allows for IWB use in areas where there is no AC power. The firmware that runs the entire unit is loaded into the multi-charge cradle. The stylus weighs about 0.8oz. It is shipped as a single package that weighs 0.21pounds. a 16.4-meter long USB cable, and a meter-long (stylus) USB charging cable for Stylus. Additionally, one is required to download the eBeam software. As expected, the cradle can only work when the wireless dongle is connected to a PC, and this requires a device driver to be installed in the PC. This driver has minimal system requirements that determine the PC hardware and OS that is compatible with this model. as well as Mac OS X 10.6 and later versions. It can also be used with a Chromebook – whose Chrome OS is forked from Linux distros – if a stable internet connection is available. or Pentium Core 2 Duo with minimum processor speed of 1.5Ghz for Mac PC. Likewise, the driver and other supporting groupware require a minimum of 250MB of hard drive storage. USB port (2.0 or higher), optical drive, 2GB RAM, and an active internet connection. Relatedly, the PC can be connected to the IWB via a USB cable. PC connection allows for documents and data to be saved in popular file formats, including PDF, PPT, and image formats. The multifunctional stylus provides mouse emulation and supports cursive writing. The active work area created by this IWB is 16feet long and 5feet high, which is considerably large for an interactive projection field. The installation options allow for easy and flexible IWB installation, especially on metallic board frames, with the mounting plates allowing for installation on non-metallic/non-magnetic surfaces. Additionally, the tracking technology used minimizes lag between stylus and receiver. Still, its most unique feature is ability to create size-scalable interactive surfaces. This IWB benefits from a 2-year warranty. Can create a size-scalable interactive surface. Maximum interactive surface area is 16feet by 5feet. Uses ultrasound and infrared tracking technology. Has positional accuracy of +/-1 mm. Supports both pen-mode with mouse (click-and-drag emulation) functions. PC module is compatible with Windows, Linux, and Mac OS. Battery-powered unit that can be used without AC power supply. Long-lasting batteries with short charging times. Cheap as compared to the afore-reviewed IWB models. Comes with a relatively thin application layer, which compels one to rely mostly on PC programs. Wireless functionality mostly requires internet connection to work. EBeam Edge Plus is a special type of portable connectable IWB that can wirelessly connect to a PC and does not need an overhead projector. It lacks a display panel, and is specially designed to transform flat surfaces into plug-n-play interactive displays. It uses ultrasound and infrared tracking technology that gives it positional accuracy of +/-1 mm. The maximum interactive surface area that can be achieved is 16 feet by 5 feet. Additionally, this battery-powered unit has long-lasting batteries with short charging times. These aforementioned features along with a quality build design makes this model the best interactive whiteboard system in this review. This is a portable, integrated 42-inch digital IWB that operates as a capture-board that supports real-time collaboration through sharing of information. It uses an all-in-one touch PC that is designed as a large 42-inch graphics tablet so as to provide a unified software-to-hardware interface that allows for tele-conferencing to be combined with whiteboarding. Design-wise, it is the digital analogue of the flipchart. It has a single writing surface, an integrated application layer, and network support that allows for internet connection. It supports wireless and bluetooth connections. This is achieved through the Bluetooth 4.0 Dual-Mode wireless technology that is backwards compatible with the earlier Bluetooth 2.1. More importantly, its capture-board functionality is powered by a proprietary technology – the Digital Vision Touch (DViT) technology – which allows for written notes and drawn images to be captured in real-time. It uses the pen mode as the primary data input method. Its smartphone integration is provided by SMART Kapp app – a free app that is bundled in the application layer of the IWB. This high-performance, feature-rich, and high-quality IWB is designed and made in Mexico by Quartet, and its model number is SK5234. This digital capture-board must be mounted to the wall, as mobile mounting options are limited. As a non-magnetic markerboard, it uses a mounting hardware dubbed French cleat, which can be used together with the standard VESA mount. Its writing panel is made of glass. The product is shipped in an assembled state in a package that contains the following items: capture-board, 4 bullet-tip dry-erase markers, power supply adapters, round eraser, and mounting hardware kit. The thin-profile capture-board is 23inches by 44inches, and its white frame features a white plastic finish. It should be oriented vertically so as to mimic an ordinary size A4 paper. The ready to use unit weighs about 35pounds. The use of a digital markerboard eliminates the need for IT integration, and the user just needs to download the required apps and start using the board. Its collaboration allows for up-to 35 people to participate in a collaborative session, with the premium app increasing this number to 250 participants. This IWB comes with an inbuilt camera that can take snapshots of the written notes, while the USB 2.0 port allows for these snapshots to be stored in removable storage drives. Furthermore, the snapshots can be saved into JPEG formats or as PDF files that can be shared via Google Drive, Evernote, and Dropbox. This IWB is compatible with both Apple and Android phones which use iOS 8.1 and Android 4.4.4 and later versions respectively. It also supports four popular web browsers; Google Chrome, Internet Explorer, Firefox, and Safari. This is an energy efficient IWB model that requires AC power input of 100-240V/50-60Hz. This IWB model benefits from a 12-month warranty. Network support and smart-phone integration via the SMART Kapp app. Multiple output formats: PDF and JPEG. Capture-board functionality powered by proprietary DViT technology that allows for written notes and drawn images to be captured in real-time. Supports Bluetooth and wireless connectivity. Has no internal speakers hence audio support must be provided by external speakers. Quartet SK5234 Kapp is a portable, integrated 42-inch digital IWB that operates as a capture-board that supports real-time collaboration through sharing of information. It uses an all-in-one touch PC that is designed as a large 42-inch graphics tablet so as to provide a unified software-to-hardware interface that allows for tele-conferencing to be combined with whiteboarding. It has a single writing surface, an integrated application layer, and network support that allows for internet connection. It supports wireless and Bluetooth connections. Moreover, its capture-board functionality is powered by the DViT technology which allows for real-time capture of written notes. Additionally, its smartphone integration is provided by SMART Kapp app. These aforementioned features and superb build design make this model the best whiteboard for mobile connection in this review. The following factors must be considered when preparing to purchase an IWB, or when choosing the best interactive whiteboard that suits your needs. The place where the IWB is going to be used matters a lot. Schools can benefit from peer-reviewed guidelines on choosing the right IWB based on current and projected classroom uses. As expected, classroom use differs from office use, and therefore you need to choose an IWB that has been purposed for use and installation in your desired area of use. The cost of the desired IWB must be within the range of your budget. Even so, cost-benefit analysis can optimize your choice of IWB as you can get the best IWB within a given price range. In the classroom, the teacher remains the center of attention regardless of the level of collaboration or interactivity demanded by the situation, and thus an IWB whose projection system allows for this should be chosen. Moreover, use of front-of-classroom display allows for easier accessibility to content by the students. The same also applies to office training sessions. This is related to IWB use, with focus placed in classroom use, though it also applies to office use. Multi-user capability means that more than one student, user, or presenter can input data to the IWB at the same time. This allows for efficient collaboration and interaction between the users. The IWB must be used in a room with limited space, and thus you must choose a model whose size fits well into the area where it is going to be fitted, or installed. Small-sized models are sometimes designed to be portable with a mobile stand allowing for their installation in any room. You should determine where the IWB is going to be fitted. If it is going to be fitted in the wall and not be moved, then it is prudent to choose a fixed IWB model. Conversely, if the IWB is to be moved from place to place, then it is prudent to choose a portable model. There is need for you to choose a data input method that you are most comfortable with, either through touch or by writing using a pen. If you are comfortable with both data input methods, then it advisable to acquire an IWB that supports both pen-based and touch-based operation. IWBs with durable construction last longer than IWBs that are made from non-durable materials. Durable IWBs are also less prone to catastrophic failure during use as compared to low-quality models. This determines the touch accuracy, power efficiency and degree of user convenience of an IWB model. It is recommended that you choose an IWB technology that you are familiar with, or whose learning curve is shallow in relation to your current training. You should check the accessories that comes with each IWB model. Mostly, you should check for printer support, tablet support, and options for incorporating a wireless unit and PRS to the IWB. Also, you should check the saving options, as well as ensure that the saved files can be stored in removable media, especially a memory card, USB stick, or an external hard disk. The application layer that comes with an IWB model determines its range of functionalities, and capacity for customization to meet your needs. You should therefore scrutinize the range of software that come bundled by default with the IWB as this would allow for cost-benefit analysis between choosing a pricier software-rich model, or a cheaper model with a thin application layer that would compel you to purchase software separately. IWBs that come with training as part of consumer education allows for better utilization of the available tools and maximization of productivity. Training can be provided as a series of lectures by company representatives, or be published in informational booklets such as user guides and manuals. Informational audiovisuals such as webinars and video-on-demand tutorials can also be used. This training should equip you with the practical skills of installing, assembling, operating, and integrating hardware, as well as basic troubleshooting. IWBs do suffer from technical faults which can interrupt learning. In such instance, technical support, in form of technical expertise provided by the manufacturer (or its representative), as well as technical advice on best practices for optimal IWB utilization should help you get the IWB working again. Besides, you gain knowledge on how best to get the most out of your IWB.